Part Number 316217002 replaces: 08017097, 1015027, 316111201, 316111203, 318087600, 318198500, 318198510, 318198520, 5303208888, 7316217002, AP3363354. Hi Debra, Thank you for your inquiry. If the bake element is not coming on then you will likely need to replace the temperature sensor. I hope this helps. Thank you and have a great day! Hi Herman, Thank you for your question. The DR error code just indicates that there is a miscommunication between your control board and the rest of your appliance. I would suggest unplugging your appliance for about 5 minutes. That may reset the board and fix your issue. Good luck with your repair. About a month ago my oven over-heated and burned things to a crisp. I ordered a new probe for it and it worked again, but seemed to run on the hot side. It just over-heated again and burned my food. What is causing this and what part do you recommend? I think it read error f10 before i disconnected the electricity. Hi Betty, Thank you for your question. If the oven is over heating the part that fixes the issue the majority of the time is the oven temperature probe. If the new part is malfunctioning, I would use a multimeter to check the continuity of the probe as well as the wiring between the probe and the electronic control board and the electronic control board to verify which of these parts is causing the issue. I hope this helps. Thank you and have a great day! Hello Rob, thank you for contacting us. The sensor is a common part to cause that code. You can test the sensor with a multi-meter to determine if it is at fault. If the readings are good then the next part would be the electronic control board PS2368652. Hope this helps! Hi Don, Thank you for the question. It sounds like it might be the probe sensor or the control board. I suggest testing the sensor with a Ohm Meter. Testing the temperature sensor probe on your oven is easy. 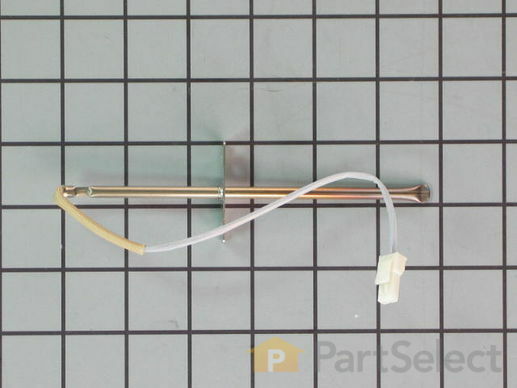 With the sensor at room temperature, measure the resistance between the two prongs at the end of the sensor connector. The resistance of the sensor should read approximately 1080 – 1090 ohms at room temperature. Hope this helps! Oven and broiler will not heat up. Hi Mickey, Thank you for the question. If both the bake and broil element are not turn on at all, we suggest you replace the Electronic Clock with Overlay - White. Hope this helps! Oven and broiler doesn't come on. I replaced the heating element and it still doesn't work. What could I be missing here? Hi Damion, Thank you for the question. If both the top broil and bottom bake element is not heating, I suggest replacing the Electronic Clock/Timer, PartSelect Number: PS1146103. This part acts as a oven controller. Hope this helps! Oven and broiler elements will not heat up. I thank everything else works ok. What do i need to replace? Hello Lewis, thank you for your question. It sounds like it might be the sensor probe or the control board. The oven is controlled by the electronic control board, and thermostat or sensor probe. The I suggest testing the sensor with a Ohm Meter. Testing the temperature sensor probe on your oven is easy. With the sensor at room temperature, measure the resistance between the two prongs at the end of the sensor connector. The resistance of the sensor should read approximately 1080 – 1090 ohms at room temperature. You can also test the elements for continuity to be sure they are both functioning. If the sensor and elements are tested and are functioning correctly the electronic control board would be the issue. Good luck with your repair! I have a 40", duel fuel, 2 oven range. Using an oven thermometer, each oven is about 50 degrees off. To bake at 350 degrees, i must set the ovens to 400 degrees. What do i need to fix this problem? Hi Stephanie, Thank you for your question. I would suggest testing your oven thermostat. It could be that it is reading the wrong temperature inside of your oven. I hope that helps. Good luck with your repair. My oven is beeping and flashing -f1- on the display. I hit cancel and within seconds it's beeping again and i can't turn the oven on. Hello Jolene, Thank you for the question. The F1 error code on this model of Frigidaire range indicates that the electronic oven control board detects one of the following errors: Failed oven temperature sensor probe. Shorted keypad. Internal electronic control board error caused by a power glitch or surge through the electrical lines. Hope this helps, good luck with this repair! It was an exact replacement for the sensor in my oven, delivered quickly, and worked fine. Had to pull out the oven so I could see what I was doing and could make sure the insulation was in. Works. Easy to install. Rather slow to arrive but better than a big repair bill. It was as advertised and fixed the problem. Took longer to take the oven out of the wall than it did to install the part. Saved myself a couple hundred dollars by not calling the appliance repairman. Right part, wrong connection, emprovised! Part arrived well wrapped in good shape. Connection was NOT correct for my oven. My husband was able to solder the original end to my new sensor and connect revised part to oven. I could not have made this work without his experience and skill. Oven works well again, so I am thankful part was available . THANKS. Could not comp!eye job on time because ceramic wire nuts were not included very disappointed! This part is defective. I put a pan of french fries in the oven, set it at 425 degrees & the temperature soard, burning up the french fries & the pan in a matter of minutes. I am EXTREMELY ANNOYED that you do not include the ceramic wire nuts with the part. They're not easily available for me, but I'm sure if you ordered them in bulk they would cost PENNIES. I'm not going to start the repair until I have them in case I need them. I will buy from other sites in the future b/c of your extremely cheap attitude about this. Is that clear enough for you?